In another chapter in my life, I was gravely afflicted by bibliophilia. And while today my financial situation precludes me from pursuing my bibliophilous desires (the Aldine octavo is my greatest weakness), I do regularly indulge in low-wager purchases, generally $10-20 online and in used bookstores. It’s remarkable how many great wine books that you can pick up, like the ones above. I recently bought the Hazan through Amazon for $4 and the Ray for $15 at a shop in San Francisco. Leafing through Italian Wine (Knopf 1982), I was blown away by Hazan’s prescient description of the wines of Angelo Gaja. without bringing up Angelo Gaja, the largest and best known. His wines, especially the ones from single vineyards, Sorì Tildin [sic] and Sorì San Lorenzo, enjoy the most extravagant praise and prices They are wines made with intense care and with the single-minded objective of making them as big and full and ripe as possible. I cannot deny that he succeeds, but, though mine may be the lone dissenting voice, I cannot bring myself to admire them wholeheartedly. Gaja’s wine does not seem to me to give what one most looks for in Barbaresco. It attempts to outmuscle Barolo, but fails to achieve the gracefulness that makes Barbaresco’s natural endowment of flavor and body stylish rather than pushy. Today, we think of Hazan as Marcella’s scribe. But in 1982, he was also one of the pioneering voices of Italian wine writing. And, man, what a passage! It’s even more powerful knowing that in the decades that followed, Gaja went on to become one of the world’s most famous and successful winemakers and one of the trade’s most brilliant marketers. I love how he so eloquently and delicately expresses his “dissent” without the slightest hint of antipathy. As I enjoyed the book last night after dinner, I marveled at how au courant it reads (save for the fact that his vintage ratings stop at 1981). The appellation maps, including excellent topographical renderings, are also superb. As for his take on the new style of Barbaresco created by Gaja, I’ll let the reader arrive at her/his own conclusions. 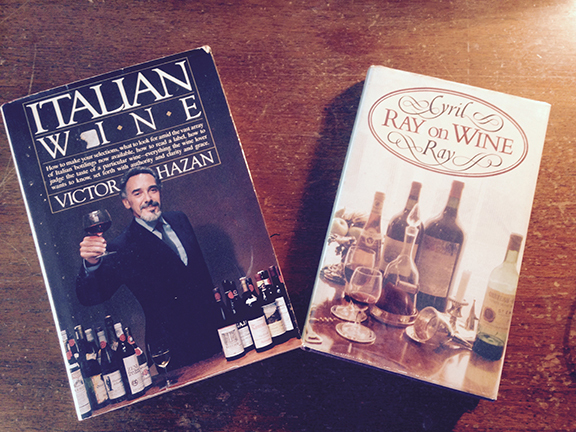 Hazan’s book was trumped this week only by Cyril Ray’s, in which I stumbled across the one of the most the most moving example of wine writing I’ve ever read. Now this is a powerful illustration of wine writing at its finest, where the author reveals so much about himself, his times, and the society in which he lives and works. It’s even more powerful considering that the experience refers back to his time as correspondent during World War II in Italy (I wrote about the passage yesterday for the CanteleUSA blog because the account comes from Ray’s time spent with British troops in Puglia). Not that I could ever achieve it, but this is the wine writing to which I aspire, where wine (the object) becomes a window onto the human experience and where a bourgeoisie can at once acknowledge his and his fellows middle-class shortcomings while using them as synecdoche for society at large. For my fellow bibliophiles, my autographed copy of Ray on Wine is set in Bembo typeface (just to bring it back to my predilection for Aldine incunabula). Thank you for letting me share my enobibliophily with you! What do weed flamer and grapevine yellows have in common? Above: a weed flamer or weed torch. Increasingly, organic grape growers in Italy are using weed flamers for grass management between rows (image via BeleCasel.it). Grapevine yellows, aka flavescence dorée, is a bacterial disease that affects many growers in northern Italy. Its vector is the Scaphoideus titanus or leafhopper. 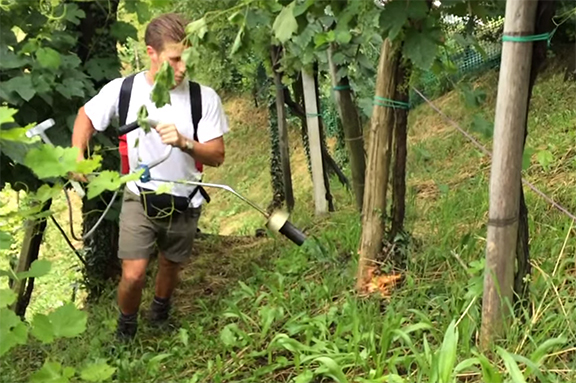 Weed torches or weed flamers are currently gaining favor among organic grape growers in Italy who have found weed torching to be an effective approach to herbicide-free grass management. The updated glossary follows. I hope you find the index useful. Thanks for speaking Italian wine! From what I’ve been told, I ruffled more than a few feathers with my post from last month on the incongruous nature of pairing big bold (Californian-style) red wine and Texas bbq. 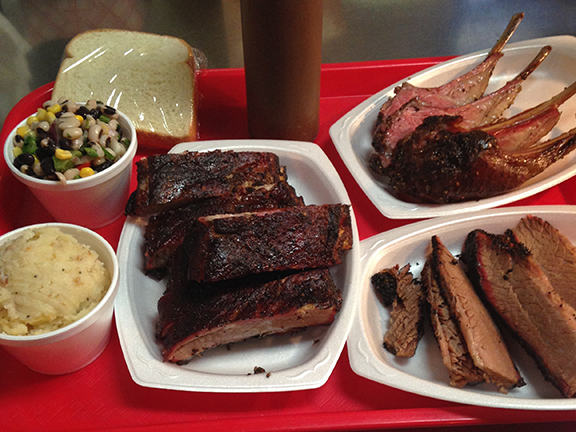 It’s important to keep in mind that “Texas” bbq is unique in the panorama of American bbq because its foundation is smoked meats (mostly beef and primarily brisket) that have been seasoned with dry rub. In “Memphis” bbq, for example, sweet and tangy vinegar-based sauce is used instead to baste and flavor pork during smoking. In my view, it’s nearly impossible to pair wine with this style of bbq because the sweetness and acidity in the basting sauce, which is often applied liberally after the meat is cooked, overwhelm nearly any wine (in Texas bbq, sauce is an afterthought if applied at all). It’s similar to the oxymoronic pairing of chocolate and red wine, however popular it may be. I recently returned to the same Houston bbq joint where I offended my comrades, Roegel’s BBQ, for a mandate with a (male) food writer friend. 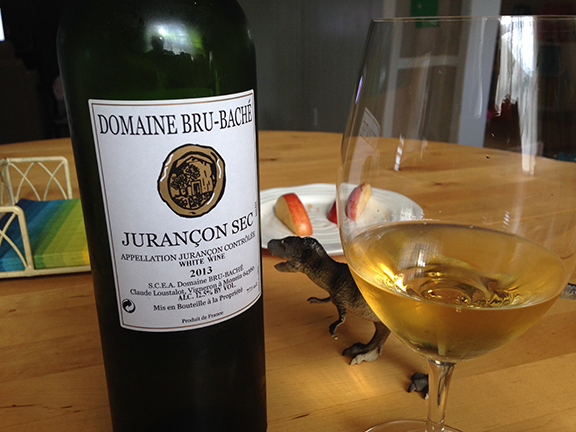 The 2013 Jurançon Sec by Bru-Baché (made from Gros Manseng in the French Pyrénées, above) was the wine I brought. In my view and on my palate, this is the style of wine that pairs best with Texas bbq, where the intense smokiness of the meats dominates the flavors. The rich white and stone fruit and gentle citrus character of this wine, its freshness despite a slightly oxidative note, and — most importantly — its low alcohol at 12.5 percent, make it ideal for pairing with dry rub bbq. It may be counterintuitive for some but the greatest pairings are based not on resemblance but rather contrast. Consider how deliciously lemon juice tastes works in fish prepared à la meunière where the fat of the butter and the lean acidity of the citrus accentuate the flavor the fish. Where the savory flavors and earthiness of my beloved Nebbiolo would be eclipsed by smoky Texas bbq, the Jurançcon delivers brilliantly — just like the lemon in the meunière. And here’s the rub (excuse the pun!). The greatest incongruence lies in the fact that many of my fellow Texans insist on matching higher-end red wines with bbq. I’ve seen this countless times. Not only are the wines technically mismatched, but they are also misaligned from a socio-economic perspective. When people cross into the “final frontier,” as Reid has called it, of pairing wine and bbq, they tend to reach for extremes, like the $50 bottle of 15.6 percent alcohol Syrah that someone poured me during my previous meal at the bbq joint. 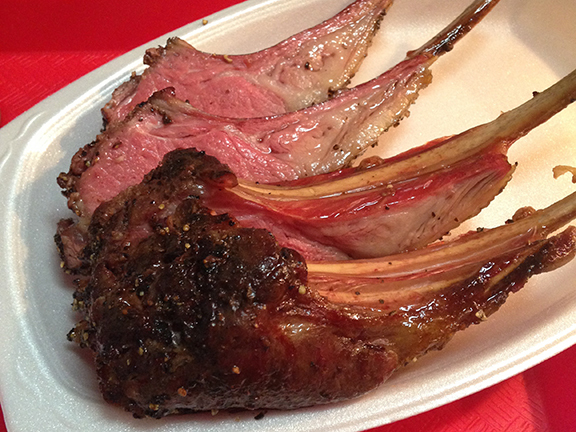 There is nothing delicate about Texas bbq and people tend to love a show-stopping “wow” factor when pairing with wine. 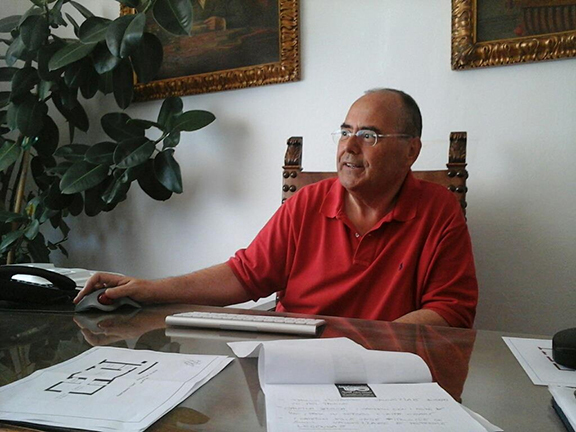 Above: I’ve always admired Stefano Cinelli Colombini’s writing and the “voice” that he has given to Montalcino and its wines. Ever since I realized that I was never going to make a decent living by translating and writing about Italian poetry (one of the great passions of my intellectual life), I’ve tried to find ways to incorporate my academic interests into my work as a wine blogger for hire. From Roman times to the current day, Italy’s cultural patrimony has continued to fascinate and inform the western world and its ars poetica, as it were, its aesthetic sensibilities. Nearly every art and literary movement today, from naturalism to the avant-garde, can trace its origins back to Italian intellectual life. Where would be today without Michelangelo… or Marinetti, for that matter? Over the arc of my adult life and career, wine and food history has taken the place of prosody as a window that offers a humanist perspective into Italy and its many wonders, natural and crafted. Whether the etymology of a term like sovescio (cover crop) or my reflections on a Pasolini poem inspired by an Italian wine merchant in Mexico City, viticulture — the culture of wine and the vine – has become a pretext and conceit for writing about a cultural legacy that continues to bewilder me. Legacy winemaker Stefano Cinelli Colombini’s writing first came to my attention via his posts for the popular Italian wine blog Intravino. On more than one occasion, I found myself translating his work for posts on my blog or blogs where I have contributed as a reporter/journalist. He is a superb writer and his posts made a deep impression on me because he is virtually the only member of the Montalcino community who speaks out regularly (and eloquently) on cultural and political issues that affect the wines, wineries, and people there. We met and tasted at Vinitaly this year. And then we met again in May at his winery in Montalcino. When I proposed that we work together to produce a blog devoted to Montalcino, its history, its people, and its wines, he was enthusiastic. He had already launched a similar project, in Italian, years ago. The result of our delightful conversations is MontalcinoBlog.com, a new online journal devoted to the history, life, and times of Montalcino — the appellation where I first discovered an interest and passion for viticulture as a student in Italy. Currently, I’m translating Stefano’s excellent History of Montalcino from the Italian and I’m loving every minute of it. Yesterday’s post — Montalcino History: Montalcino fends off the Medici’s troops and becomes Italy’s last free city — was a study of numismatics. Stefano’s notes on coins forged by Montalcino during the 1550s became a rabbit hole that had me researching Latin inscriptions during the Renaissance. There’s an expression in Italian: pane per i miei denti, literally bread for my teeth or something I can really sink my teeth into. Call me a kid in a candy store. It’s a dream job for me and I’ve been having a blast reading and corresponding with Stefano, whose erudition and knowledge of Italian history (not to mention his classic Tuscan wit) are as entertaining as they are thrilling. Once I complete my translation of his history of Montalcino, we’ll move on to myriad subjects he’s covered in his writings and work. There’s much more groovy stuff to come. Today you are two, sweet girl! Mommy, daddy, and sissy love you so much! I really enjoyed translating this post today for my clients and friends at Bele Casel. 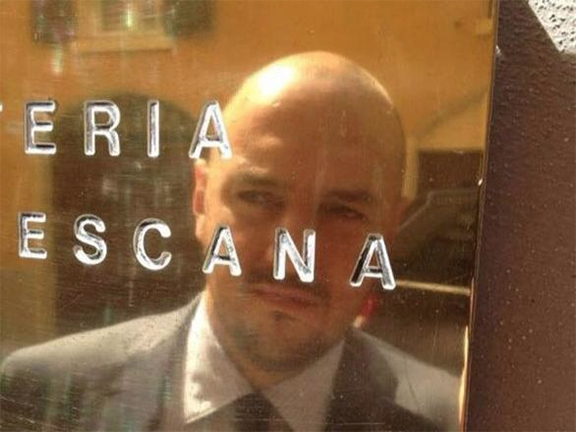 In it, Osteria Francescana wine director Giuseppe Palmieri (above) discusses his approach to wine pairing and his list at the Michelin three star, a restaurant considered by many to be the best in Italy right now. Above: a new and more acidity-driven style of wine is emerging among producers of “cult” wines from Napa. San Diego-based winemaker Duncan Williams and I first met in 2007 when I was researching Italian grape varieties grown on Californian soil. I visited him at a winery in Fallbrook in southern California where he was growing and vinifying Sangiovese at the time. Impressed with the freshness and overall drinkability of his wines, I’ve stayed in touch with him over the years and we occasionally taste together when I’m in San Diego. 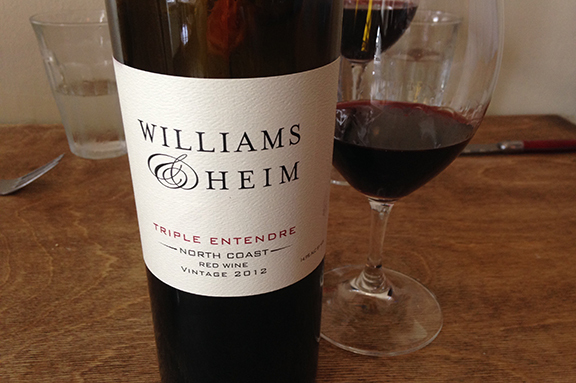 On Saturday, following the Franciacorta Real Story tasting at Jaynes Gastropub, he tasted me on one of his new wines, the 2012 Williams and Heim Triple Entendre (50% Cabernet Sauvignon, 33% Merlot, 17% Cabernet Franc). This wine had healthy acidity and good balance. Although the wine is very young and has at least a few years ahead of it before it fully comes into focus, its wood (55% new barriques) is already well integrated and its alcohol didn’t jump out ahead of the wine. I liked it a lot. If you’re looking for a new cult Napa wine to collect, this is the ground floor. Check it out here. The following post comes from Lawrence Cohen, a friend and wine rep who sells wine to Sotto in Los Angeles where I author the wine list. He possesses encyclopedic knowledge of European food and southern California restaurants. A recent conversation about the “best restaurants in Tijuana” prompted him to compose the following dispatch on La Querencia, which I gladly share here. Note that there is another La Querencia on the American side of the border in Chula Vista. Although I believe the two restaurants are related, the menus are far from identical. 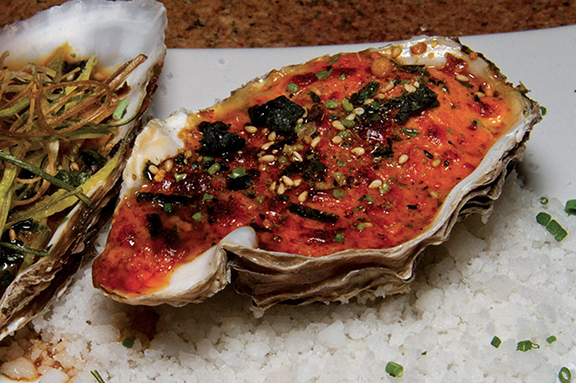 Above: abalone at La Querencia in Tijuana. Los Angeles-based gourmet Lawrence Cohen recommends the restaurant’s abalone and chorizo sopes (image via La Querencia website). La Querencia is the best restaurant in Tijuana. And it is excellent for a crowd, or for romantic dinner for two. The mixture of the best food and casual family ambiance where you can bring the kids or the fine wine party of serious diners, with easy going service make La Querencia the go to restaurant of Tijuana. There is no other restaurant in Tijuana we returned to as often or as happily as La Querencia. Aided by Sotto owner/executive chef Steve Samson and his team, chef Isabella Pedroli Giordano (above, left, with her mother) prepared an ASTOUNDING authentic Ligurian menu for a sold-out crowd on Monday. Los Angeles-born-and-bred, Isabella is slated to be the sous chef at Steve’s new Emilia-concept to be called Rosso Blu. 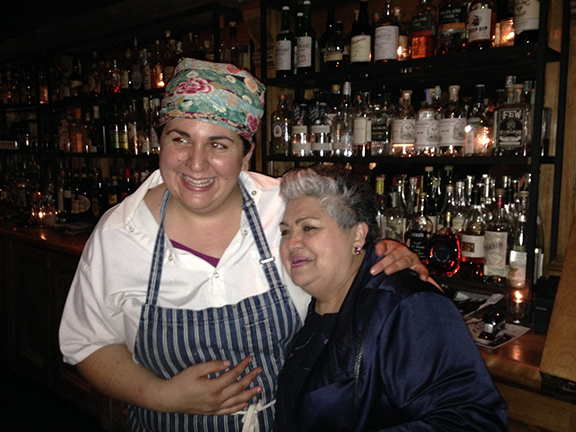 I had a blast drinking Pigato and talking food with her at the end of the evening. Unfortunately (fortunately? ), I was too busy pouring and talking about Ligurian wines to properly photograph her excellent food. But I was blown away by the materia prima and the way she handled it. 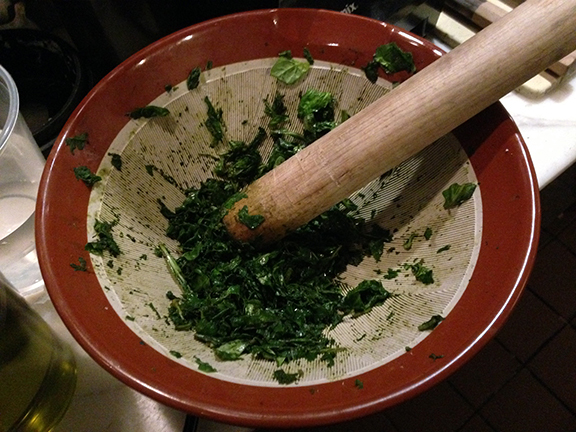 The California basil — used for her pesto — was enough to make you swoon. I was speaking to the waitstaff about the wines during lineup when the seductive aroma of freshly crushed basil leaves began filling the dining room as chef Isabella’s équipe put their pestles and mortars into action. It happens every spring and summer when I visit my home state of California: once again I was floored by the bounty of high quality produce from in the El Dorado state. 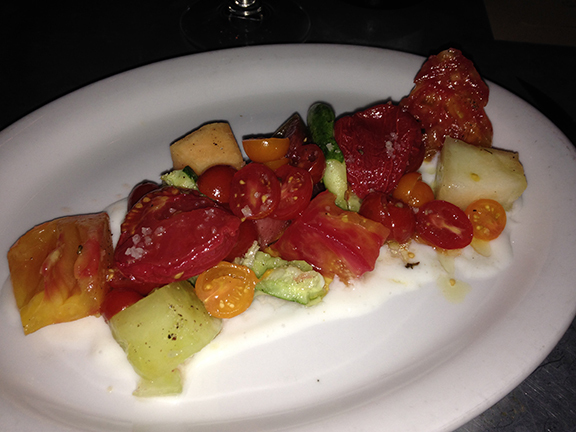 When I sat down for dinner on Tuesday night at St. Vincent, one of my favorite wine spots in San Francisco, owner and Italian wine sage David Lynch insisted (rightly) that I have the tomato and melon salad (above). My beloved Golden State aside, few farming communities in the U.S. can deliver nightshades like this outside of Italy. 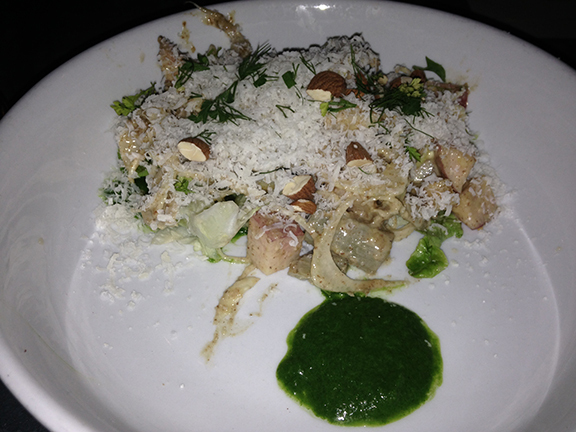 It was rivaled only the artichoke, butter lettuce, white peach, and almond salad (below). Purely delicious, focused, and wholesome. It’s been tough to be away from the girls this week but I was cheered by the turn-out at my Franciacorta Real Story tasting yesterday in the Golden Gate City (below). 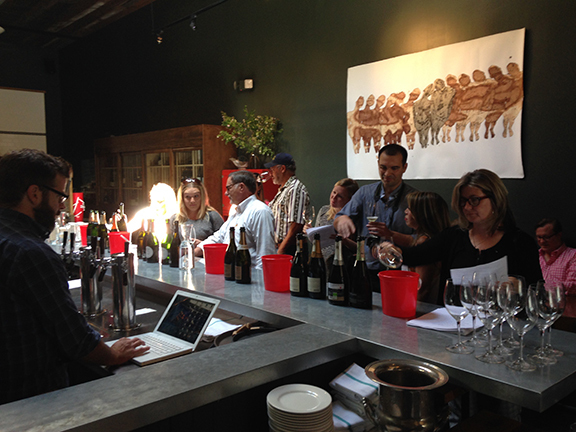 Thanks to everyone who came out to taste and chat Franciacorta. 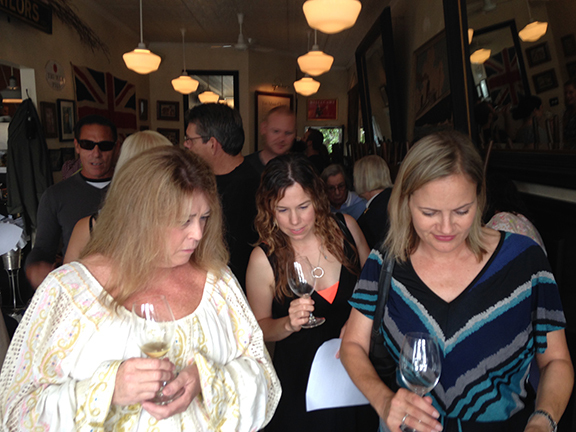 Tomorrow we’ll be doing the same tasting — 14 wines — in LA and Saturday in San Diego. Click here for details and RSVP info. Only a few more days on the road before I get back to my ladies and some needed downtime. Wish me speed! Georgia P and Lila Jane, my sweet girls. Today is my forty-eighth birthday. I wish I were at home with you today to celebrate. But I’m traveling for work this week in California, where I grew up and went to school. We’ll celebrate together when I get back. It’s so incredible to think about how much the world has changed from the time I was your age until now. When I was your ages, we had rotary-dial telephones, vinyl record players, and televisions. Today, we watch music videos of astronauts on the International Space Station and listen to our favorite songs on high-resolution smart phones that are thinner than a chocolate bar. The first astronauts to reach the moon landed there when I was about Lila Jane’s age and 8-track tapes hadn’t even been invented yet! The world has changed a lot in the nearly half a century since I was born. 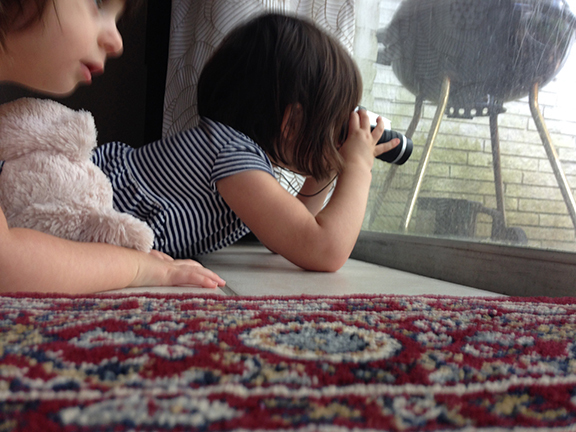 And today, even in the short time since mommy gave birth to you, the world continues to change at breakneck speed. Over the last few weeks alone, our family has witnessed some remarkable cultural and social milestones in our country that neither mommy nor I could have even imagined when we first met each other in 2008. Affordable health care for the less fortunate among us; marriage equality that will help bolster family life and remove a stigma from many of our sisters and brothers; and a new dialogue on racism in our country that — mommy and I hope — will make our country a much better place to live for all people. I’m more proud of being an American than I ever have been. You are Americans, too. 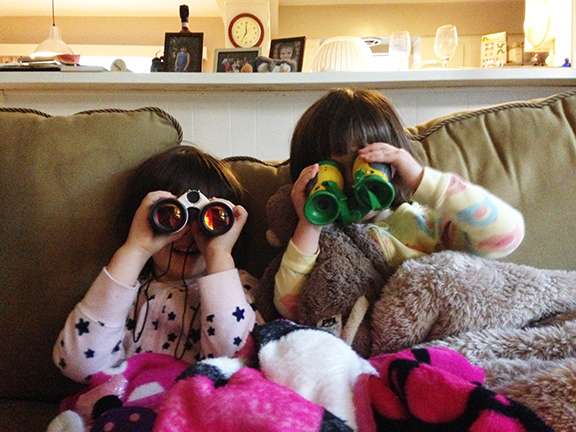 And I’m glad that you two are growing up in a world more tolerant than the one that mommy and I grew up in. Our family and our life together make me think a lot about how the world has changed and how it is changing every day. You are changing and growing, too: every day you surprise mommy and me with new vocabulary, new games you like to play, and puzzles you solve. And every weekend, when we play music and sing in my office, you amaze me with how quickly you learn new melodies. But more than anything else, you both amaze mommy and me with your sweetness and your empathy. We’ve seen both of you take care of one another when you’re hurt or sad. And we love the sweet kisses, caresses, and pats on the back that you give us to show us that you love us. Today, I’m forty-eight years old and I couldn’t be more proud to be your father. You fill our lives with light and joy and I can truly say that these years, since you were born, have been the very best of my life. I never could have imagined the change that you would have brought into our lives. And every day, I know I am blessed to be here with you and mommy. Thank you for the best birthday I’ve ever had, sweet girls. Thank you. I love you.